PURPOSE: To establish policy governing restrictions on access to USFJ installations and areas by certain third country nationals. 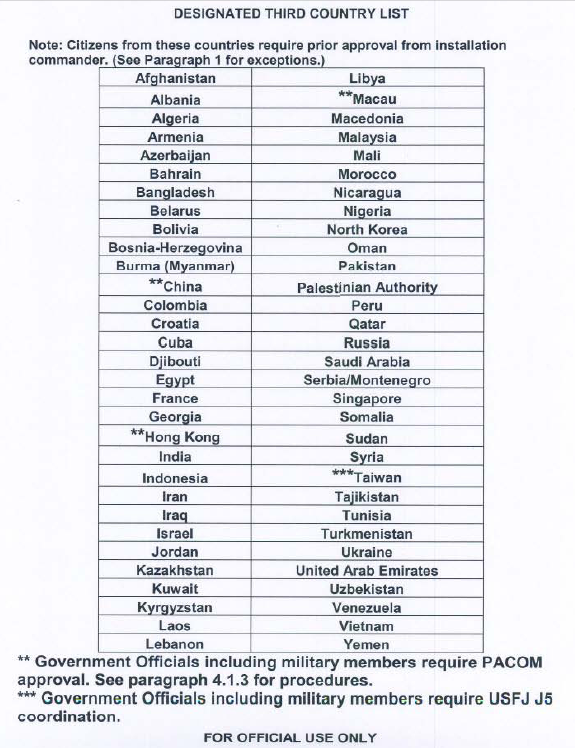 Updates the Designated Country list (Attachment I), procedures and diplomatic prefixes used in Japan. 1.1. Immediate family member of sponsor or sponsor’s spouse that are citizens of a designated third country. Immediate family members are defined as parents, grandparents, siblings, and sibling ‘s children under 21 years of age. Burden of proof for such relationships is the sponsor’s responsibility. Immediate family members who are government officials. including military, from one of the countries marxed •• in Attachment 1 of a designated th ird county must gain advance approval as outlined in section 4.1.3. 1.2. School children and school officials who are citizens of designated third countries that are attending DoDDS sponsored events. 1.3.1. 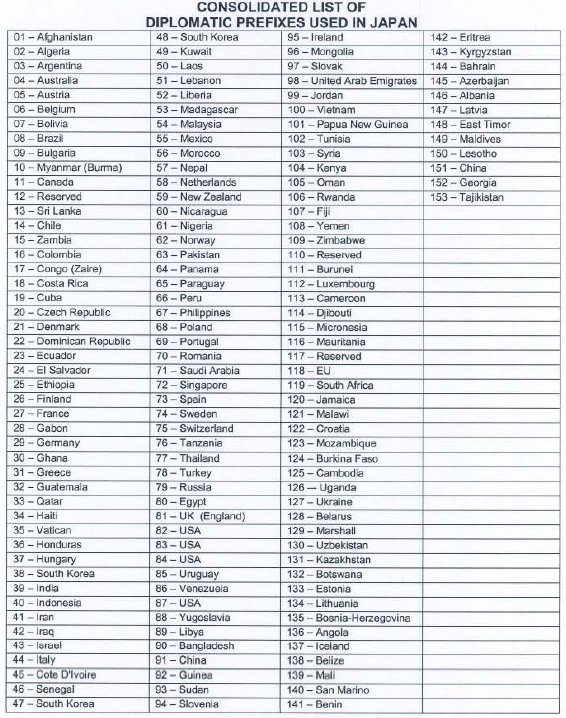 Names, ranks, and positions of persons concerned. 1.3.3. Date and place of planned entry, and period of stay. 1.4. If the host commander disapproves the planned visit, he will furnish a copy of the communication announcing his decision to HQ USFJ, Attn: J03. If the host commander concurs with the planned visit. such concurrence will be fOlWarded to HQ USFJ, Attn: J03, with the information required in paragraph 1.3 to arrive not less than 30 days prior to the planned date of entry. 1.5. If COMUSJAPAN concurs with the proposed visit to U.S. Forces facilities, COMUSJAPAN will inform the GOJ through the Joint Committee of its intent to authorize Third State Nationals to visit U.S. Forces facilities. COMUSJAPAN will advise host command whether entry notification is received without objection. 2.1. Commanders for respective components, installations. 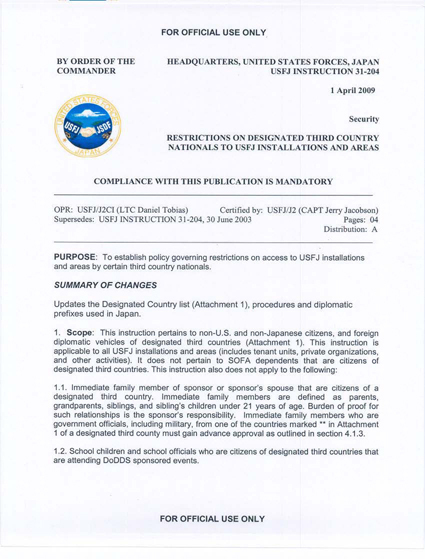 and activities under USFJ, establish guidelines for entry into installations under their command by non-SOFA U.S. persons, Japanese nationals, and non-SOFA citizens of third countries, which are not referenced in Attachment 1. In addition. commanders will develop their own procedures for the exceptions contained in paragraph 1.1 and 1.2. Such policies will be coordinated through the USFJ Provost Marshal’s office (USFJ/J023). part of official USFJ or service component ceremonies or meetings do not require Installation Commander Approval but stili require USFJ J51PACOM approval. However, notification, to include a list of all attendees, will be made to the respective Installation Commander and counterintelligence organization for screening.